Data from the U.S. Census Bureau show that real median household income—the most frequent barometer of middle-class incomes—has only grown 0.23 percent per year since 1985 and has actually fallen since 2000. Feldstein claims that there are several methodological flaws to the Census Bureau’s published median household income measure, such as its failure to adjust for aging or shrinking household size. He argues that middle-class income growth appears to be relatively robust after making these corrections and including the effects of tax cuts and transfers from the federal government to households. Unfortunately, Feldstein’s column misses the policy-relevant forest for the methodological trees. Most importantly, the entire increase in middle-class income since 2000 is a result of lower federal taxes and more transfers from the federal government. This new, disturbing disconnect between economic growth and middle-class market income growth should be at the center of the economic policy debate today. The Census Bureau’s definition of income counts regular sources of cash income before taxes with a few exceptions, such as realized capital gains. It includes wages and Social Security checks, but not employer-provided health insurance or food stamps. A closer look at the CBO data for families with children, however, paints a disturbing picture of how the U.S. economy has delivered for middle-class families since 2000. * Middle-class families with children experienced a 14 percentage point increase in comprehensive income between 2000 and 2011—the last year for which the CBO provides data—but 8 percentage points of that increase came from federal government transfers and 6 percentage points came from tax reductions. Market income actually fell over that period. In other words, the entire increase in middle-class incomes came from tax cuts and transfers from the federal government. The picture becomes even more depressing when examining the form those transfers took. Almost 60 percent of the increase in transfers came from Medicare and Medicaid, which households can only spend on health care. The CBO adjusted these transfers for overall inflation, but health care inflation grew 50 percent faster than overall inflation between 2000 and 2011. Correctly calculating health care inflation is tricky, but the CBO data likely overstate the real value of the increased Medicare and Medicaid transfers received by households. The reliance on the federal government’s taxes and transfers to engineer middle-class income growth appears to be a purely post-2000 phenomenon. An important shortcoming of the CBO data is they do not begin until 1979. Instead, the Center for American Progress used data from the Census Bureau to produce a measure of median market income. It includes cash income from market sources except for realized capital gains: wage income, business income, farm income, and income from capital, such as rent, dividends, and interest. CAP also fixed the technical shortcoming that Feldstein argues makes the Census data misleading by only including nonelderly households, using a standard adjustment for household size partially used by the CBO,** and adjusting for inflation with the price index used by the CBO, which displays less inflation than the consumer price index used by the Census Bureau. Figure 2 shows the trend of median market income beginning in 1967, along with real gross domestic product, or GDP, per capita and the CBO’s comprehensive income and market income for families with children in the middle quintile. 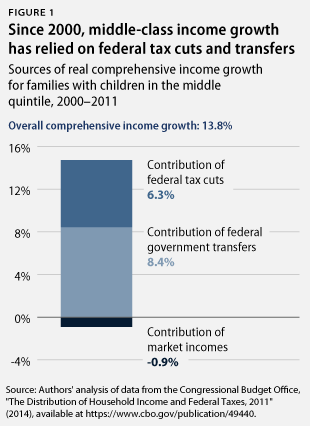 Middle-class income growth’s reliance on federal government taxes and transfers from 2000 to 2011 is new. Between 1967 and 1979—the first year for which the CBO provides data—real median market income and GDP per person grew 2.3 percent per year. The close relationship between real GDP and median market income shows that middle-class families were getting a sizeable share of economic growth during this period. Between 1979 and 2000, middle-class market income grew more slowly—about 1 percent to 1.2 percent per year with both the CBO and Census measures—and comprehensive income grew at a similar same rate. While all three income measures were growing at a much slower pace than GDP per capita, middle-class income gains were coming from the market, not the government. 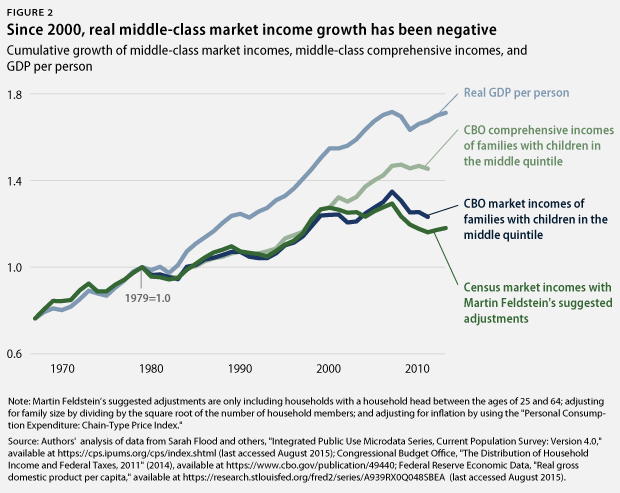 There has been a divergence between comprehensive and market income only since around 2000, indicating that middle-class income gains now rely on the federal government. Rather than debating technical adjustments—such as household size and inflation indexes—that do not change the qualitative picture of middle-class incomes, the discussion should center on the fact that the only recent middle-class income growth has come from tax cuts and transfers. While progressives believe there is a critical role for progressive taxation and smart government transfers to raise middle-class incomes, they also believe that middle-class market income’s failure to grow since 2000 is the greatest public policy challenge facing the country. To address that challenge, the Center for American Progress recently laid out a set of policies that would raise middle-class incomes, such as making it easier for workers to form unions and encouraging companies to share profits. The question, then, is: How do conservatives propose to raise middle-class incomes—by increasing market income or cutting taxes while increasing transfers? Arithmetic suggests there are limits to how much one can raise middle-class incomes through taxes and transfers without raising taxes on the wealthy or increasing the deficit. A middle-class policy agenda that consists of middle-class tax cuts funded by cuts to middle-class programs or cuts to long-term economic investments, such as education, is not credible. Accurate measurement is important, but policymakers and journalists should focus on the question of how to raise middle-class incomes rather than worrying about technical adjustments that do not affect the overall picture. Brendan V. Duke is a Policy Analyst for the Middle-Out Economics project at the Center for American Progress. Andrew Schwartz is a Research Associate for the Economic Policy team at the Center. * CAP focuses on families with children within the Congressional Budget Office data to control for the downward effects of aging on incomes. The CBO only provides data for three groups—households with an elderly head of household, households with children, and a leftover set of nonelderly households without children. ** Equivalizing income divides total household income by the square root of the number of household members, which accounts for the economies of scale of living together. The CBO equivalizes incomes for its ranking, but the average income per quintile is not adjusted for the sizes of the households in the quintiles.